Clixtell provides real-time analytics reports for clicks, calls and conversions, advanced AdWords click fraud detection and protection tool for online advertisers and digital marketing agencies. Clixtell technology helps businesses increase sales, profit & ROI. We identify and automatically block invalid clicks. Gain insight about clicks, calls & conversions by revealing the visitor's full journey from search keywords to call and conversion. 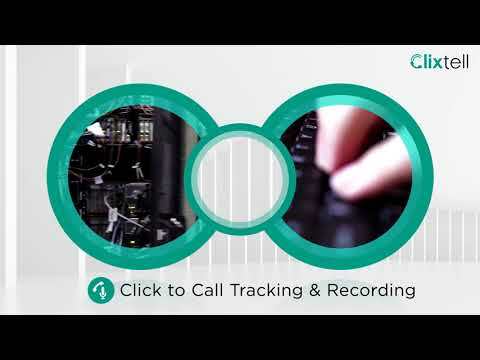 Clixtell is the most accurate & advanced tracking application available to date. My main workflow is SEO, Google Ad's, data analyst - for various clients. One of my smaller tech clients was under an advanced click fraud attack from at least two tech competitors. I tested all (yes all) anti-click fraud platforms, without doubt, Clixtell data is the most quantifiable. UX is fantastic, set up is dev cost-free if you use G-Tag manager & super swift. What more is there to love? Well .....The fact that Clixtell is forever evolving, I LOVE the new-ish session recordings & stronger VPN detection/notifications. Some of the others have many fancy graphs and basically inaccurate data - easily detectable if you track in conjunction with GA / server logs in extreme cases. So going back to my opening statement - accurate & advanced. Hmmm, trying really hard to think of a con, as there are certainly zero cons here as such. There have been a couple times where there were glitches in the system - but that is usual of anything tech. I had one "iffy" customer support encounter - that was swiftly resolved & in complete contrast to the exemplarity customer support. Clixtell was easy to use right from the beginning & helped protect us from countless fraudulent clicks. It seems to use almost no resources in the background while still providing a fast and safe online workspace. Initially we were unsure if Clixtell would really work as well as it was advertised. What we came to find out was that it works more effectively than we ever imagined. Had we been available to incorporate it sooner, we would have. It dose the Job! and that is Much for a lot of our clientsIt Works! some of our clients would have had to stop marketing if Clixtell would have not come up with a true solution for click fraud . It Works! some of our clients would have had to stop marketing if Clixtell would have not come up with a true solution for click fraud . Couldn't stop some fraudulent bots, but nobody can. After trying one of the bigger brands, we found we lost good traffic due to many false positives, and after a couple of months we switched to Clixtell. Conversions went back after the switch. Analyzing the blocked traffic we didn't find IPs that were blocked without a good reason. Management of rules and IPs is super easy.Very easy to integrate, flexible blocking rules, extensive details for each IP, the session recorder comes in handy at times. Very easy to integrate, flexible blocking rules, extensive details for each IP, the session recorder comes in handy at times. Search, filters and export for the Traffic tab could be enhanced for advanced advertisers. Monitor, track and control every click and call from our user-friendly dashboard. Identify what makes your phone ring and if paid ads are being clicked by competitors using bots, scripts or VPN's. Increase ROI by blocking competitors automatically and immediately to prevent further invalid clicks. Below are some frequently asked questions for Clixtell. Q. What type of pricing plans does Clixtell offer? Q. Who are the typical users of Clixtell? Q. What languages does Clixtell support? Q. Does Clixtell support mobile devices? Q. Does Clixtell offer an API? No, Clixtell does not have an API available. Q. What other apps does Clixtell integrate with? Q. What level of support does Clixtell offer?